A boy alone in his room. What would it be like to go on safari? A boy named Leonardo begins to imagine and then to draw a world afar—first a rhinoceros, and then he meets some monkeys, and he always has a friendly elephant at his side. Soon he finds himself in the jungle and carried away by the sheer power of his imagination, seeing the world through his own eyes and making friends along the way. 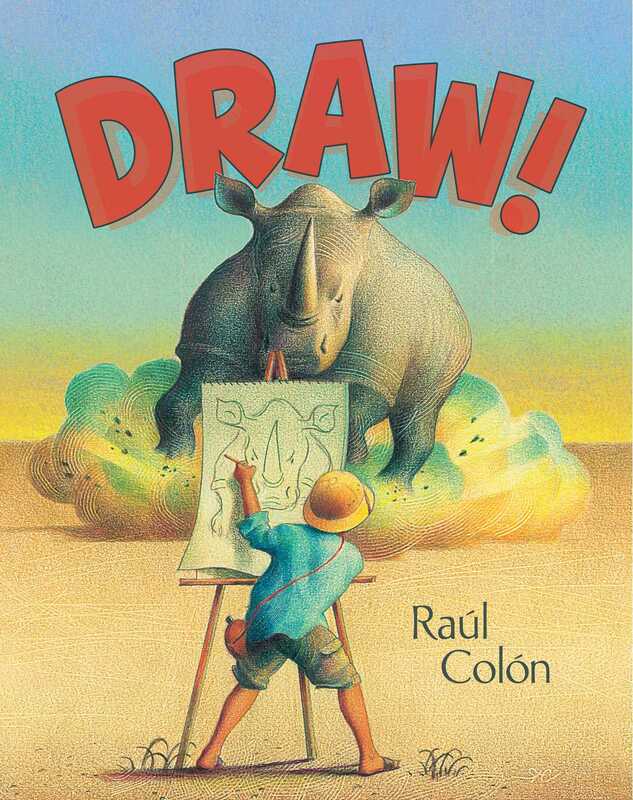 Photography by Gail Gaynin / Morgan Gaynin Inc.
Raúl Colón is the award-winning illustrator of many picture books, including Draw! an ALA Notable Book and recipient of the International Latino Book Award; Imagine! an ALA Notable Book, a New York Public Library Best Book for Kids, and a Bookpage Best Book; Susanna Reich’s José! Born to Dance; Angela’s Christmas by Frank McCourt; and Jill Biden’s Don’t Forget, God Bless Our Troops. 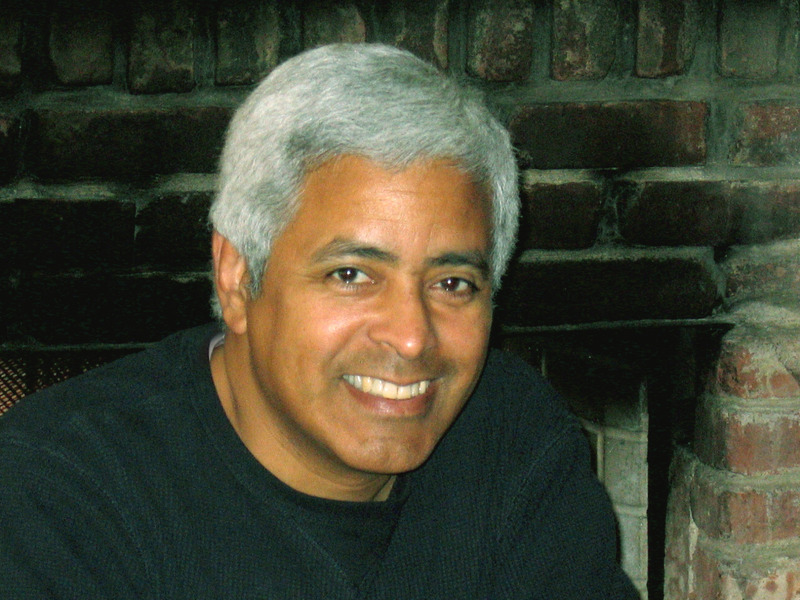 Mr. Colón lived in Puerto Rico as a young boy and now resides in New City, New York, with his family. Using watercolor and colored pencils, Colón has created a wordless book (based on his childhood) that speaks volumes. A boy, home for the day perhaps because of an illness, sits on his bed reading a book about Africa. He begins to draw. Five identical, intensely colored pictures of the boy with an easel, art supplies, and a pit helmet increase in size as readers begin this richly imagined day on a safari. He draws an elephant as an egret watches, and atop the elephant’s back, the boy and bird find a herd of zebras. They pose for him as he sits on a stump. Giraffes thunder by, raising clouds of golden dust. The boy draws them, his body aslant as his eyes follow them. He draws a gorilla, who holds his helmet and shares his sandwich. He draws lions, a water buffalo, and a hippo before sighting a charging rhinoceros. Running with all his might, he barely escapes the rhino. Baboons retrieve his pencils, set up his easel, and draw him. They also eat his sandwiches as the day slides into evening. A spread poignantly captures the parting of boy and elephant. Eyes closed, he lays his head against his friend’s side while the elephant’s trunk gently caresses the boy’s cheek. As six identical paintings decrease in size, the book returns to the boy’s pale room, now strewn with drawings. The final scene shows the boy at school, holding the elephant’s picture front and center. The pleasure the boy takes in making and sharing his art is palpable. Young artists will love this book, as will all children who know the joy of exploring their own imaginations. A must-have for every library. A boy in bed, asthma inhaler within reach, sketchbook at his side, looking at a book about Africa, is not confined by the walls of his room. As he begins to draw, he takes a journey. The palette changes from subdued pen-and-ink with wash in the bedroom to vibrant hues textured with scratched-in lines that seem to pulse, capturing the landscape and animals of Africa. On this wordless art safari, based on Colón’s own childhood imaginings, first up is the elephant. This fellow is so pleased with the boy’s portrait of him that he then accompanies the boy on his “hunt.” They spot a zeal of zebras (one watches as the boy creates) and a pride of lions. A charging rhinoceros is calmed when shown a sketch of himself—made just in the nick of time! Youngsters will pore over each spread in wonder, soaking up the details. Upon his “return,” the traveling artist shares his pictures with his classmates. A true celebration of where our imaginations can take us. A young artist, inspired by his books about African animals, is transported to an imaginary safari in this dreamy wordless book. Armed only with his pencil, sketch pad, and easel, this budding Leonardo finds his models in the African landscape—an elephant, zebras, giraffes, lions, gorillas (one of whom snatches the boy’s pith helmet and lunch)—and all willing to pose. He has some adventures—a rhino charges him but is quickly placated when the boy shows it (from the safe distance of a tree branch) the portrait he drew. Then a group of baboons take the boy’s drawing implements and turn the tables by sketching him (and it’s not a terribly flattering portrait!). Ultimately he ends up back in his own bedroom, surrounded by the books that inspired him and the sketches we saw him make on his safari. The story line is engaging and easy to follow, and, while it’s whimsical, the majesty of the animals comes through in both the boy’s sketches and the main illustrations. Colón’s pen-and-ink, watercolor, colored-pencil, and lithograph pencil pictures are nicely textured and tinged with golden hues. A final illustration shows the boy sharing his artwork in a class presentation; an appended author’s note describes Colón’s “aha moment” for the book. In this marvelous wordless adventure, Raúl Colón (Abuelo) takes us on safari through a boy artist's imagination. Colón, who suffered from asthma as a child, calls to mind in pictures here what Robert Louis Stevenson's words do in "The Land of Counterpane." Colón uses his pencils to summon a safari's worth of animals. The boy artist, pictured in bed in pen-and-inks and watercolor, looks at a book about Africa, a safari hat, sketchbook and stash of pencils nearby. A sequence of full-color images in Colón's signature compositions leads us into the creations of the artist in his imagination. The two styles clearly delineate the bedbound child and his imagined self as artist on safari. The young artist appears with canteen and easel slung over his shoulders, waving to an elephant. The elephant stops to model for a portrait. You could teach an art class from observing the young artist's lines. The elephant, pleased with the results, offers the boy a ride. Zebras pause by an acacia tree for a portrait; the boy contorts himself to sketch a herd of swift-moving giraffes. He gazes at a pride of lions from a safe distance, and a gorilla grabs the boy's hat and lunch as the price for posing. The climax involves a charging rhino in a heart-stopping four-part sequence.The book closes as it opens, with a sequence that charts a poignant parting from his pachyderm friend, and a return to the boy's bedroom. One last image takes the boy from his solitary work to an appreciative audience. Bravo! --Jennifer M. Brown, children's editor, Shelf Awareness Discover: A marvelous wordless adventure in which a bedbound artist takes readers on safari via his imagination. Book Cover Image (jpg): Draw!